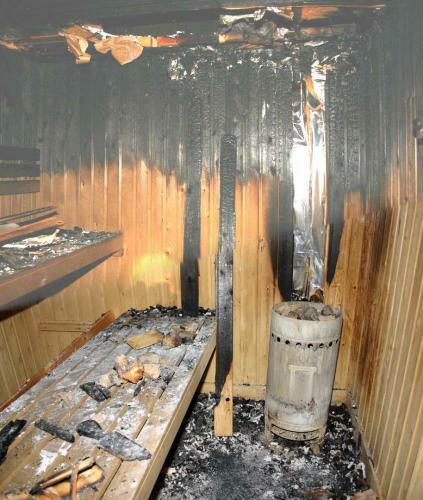 From time to time investigators from Burgoynes have been called upon to investigate the causes of fires that have occurred within sauna cubicles. Such fires, occurring as they do in sauna compartments that are timber-lined, are prone to develop rapidly and often cause substantial damage. Where such cubicles are located in leisure complexes or hotels, the fires can lead to substantial economic loss. 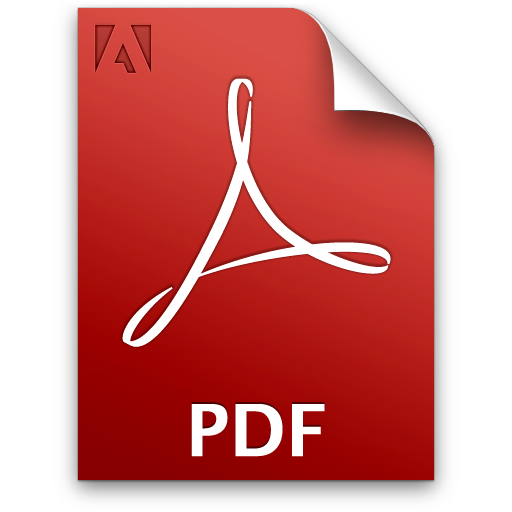 Several guidance documents have been produced1,2,3,4 relating to the installation and operation of saunas and an European Standard (BS-EN 60335-2-53) exists to provide manufacturers and installers with guidance relating to the design and construction of such equipment. As part of the investigation into the cause of one particular fire, Burgoynes and one of our leading competitors commissioned tests at EXOVA (formerly Warrington Fire Research) on a mock-up of a working sauna cubicle fitted with an exposed heater. The cabin was fitted with thermocouples in order to measure the temperatures achieved under a variety of commonly-cited fault situations, such as incorrect installation, instances of misuse and component failure. The litigation issues relating to the incident were resolved before the tests were carried out and it was agreed that in order to improve the knowledge base relating to the investigation of sauna fires, we would co-fund the tests. Some of the results are summarised here. placement of combustible objects on the heater. When the ventilation in the sauna cubicle was increased by leaving the door ajar, the temperature of the heater rose to approximately 350°C. This was because the heating elements inside the heater remained energised for a greater proportion of the time, as the control circuitry attempted to keep the temperature of the cubicle at the set point. The overall temperatures at the ceiling and wall did not alter markedly. In order to simulate failure of the temperature control thermostat and over-temperature cut-out, these devices were bypassed and the heater was left energised for over four hours. With just the thermostat by-passed, the heater temperature rose steadily until the over-temperature cut-out operated, by which time the heater had reached a temperature of 414°C; the ceiling and wall had reached temperatures of 154°C and 141°C respectively. The safety cut-out was then bypassed and the heater allowed to operate in an uncontrolled manner to reach an equilibrium. The maximum temperature of the heater was found to be 427°C. The maximum temperatures of the ceiling and wall were 177°C and 167°C respectively. Slight thermal degradation of the timber on the wall directly behind and above the heater was noticed after these tests. Unsurprisingly, the placement on the heater stones of lightweight combustible materials, such as a towel and small wooden item representing a ladle, led to the evolution of smoke and ignition within a short length of time (17 minutes and 4 minutes respectively). The only ignitions that took place in these tests were caused by the placement of combustible materials (a towel and small wooden item similar to a ladle) on top of the sauna heater. These findings reinforce the importance highlighted in many publications on sauna safety of good housekeeping and regular checks, particularly when the heaters are first turned on, to ensure nothing is left on top of or in close proximity to the heaters. 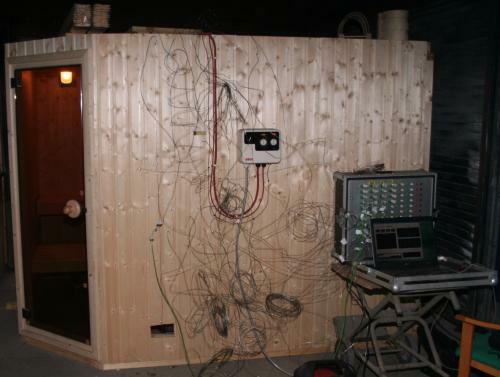 Even under conditions involving the failure of the temperature control circuitry, the temperatures measured during these tests remained too low to pose a likely risk of igniting the wall and ceiling of the sauna cubicle. The tests were not, however, designed to examine the issue relating to changes in the ignition temperature of wood by exposure to elevated temperatures for a prolonged period nor to consider other mechanisms postulated for the low-temperature, long-term ignition of wood. This includes the mechanism whereby ageing effects can weaken/warp the wooden lining of a sauna cubicle, leading to a risk of combustible material (the wooden lining) falling on to or against a heater. The relevant publications again recommend frequent inspections to ensure the wooden lining is kept in good condition. 1 Risk Control document RC50 ‘Fire Safety In The Construction And Use Of Saunas’, published by the Fire Protection Authority. 2 ‘Sauna Fire Safety’, ref No 2014 (v1) - part of the Hardfacts series published by Aviva Risk Services. 3 ‘SPATA Standards Volume 3’, Published by the Swimming Pool and Allied Trades Association Ltd.
4 ‘ISRM Operators Guide To Sauna Room Services’, published by The Institute of Sport and Recreation Management.